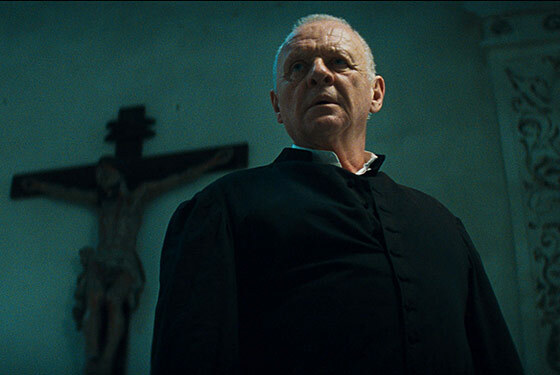 encouraging them, a) to train an exorcist, which is what John Paul II asked us before he died, and b) to help the seminary rectors begin to take this on in formation because there’s very, very few priests who have any exposure to this.” Talk about a Hail Mary pass. As the Catholic Church loses members over revelations of rampant pedophilia and Vatican cover-ups, the best recruitment strategy might well be to remind wavering souls that their only hope for keeping the Devil at bay is to stick with the program. Hopkins is surprisingly good and low-key in his first scenes, but that’s not because the Old Ham has changed his ways. It turns out he simply needs to save the eye rolling and funny voices for when Lucas himself is possessed and Michael must either find his faith (“You can only defeat it when you believe”) or quit the field of battle in front of the dishy journalist (Alice Braga) who’s chronicling his spiritual journey. Why belief should be a problem at that point is unclear. Director Mikael Hafstrom and screenwriter Michael Petroni have served up enough supernatural swill (uncanny predictions, voices from the dead, SCARY CLOSE-UPS of stone animal statues, a soundtrack of HISSES and ROARS from the BOWELS OF HELL) that their hero would have to be deaf, blind, and dimwitted to remain a skeptic. That’s the advantage movies have over real life: You can always rig the case. The Rite begins with a quote from John Paul II: “The battle against the Devil, which is the principal task of Saint Michael the Archangel, is still being fought today, because the Devil is still alive and active in the world.” Earlier this month, Irish broadcasters RTE uncovered a 1997 letter from John Paul II’s Vatican ordering Ireland’s Catholic bishops to refrain from reporting child-abuse cases to secular authorities. The revelation of the letter — dubbed a “smoking gun” by victims’-rights lawyers — might be a coincidence. Or it might be God’s way of saying we’re looking for the Devil in the wrong places.